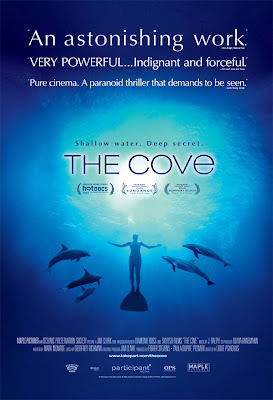 THE COVE – It sounds an awful lot like a horror movie to me. In reality, it is a new documentary that it so much more horrific than any horror film I’ve seen in ages. 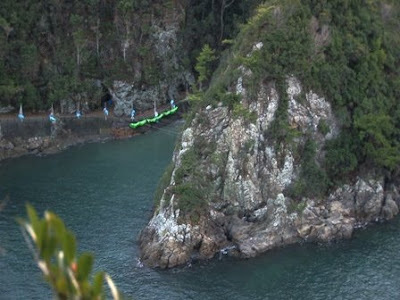 There is a cove in a national park in Taiji, Japan. Every September, thousands of dolphins pass by this cove as part of their natural migratory pattern. Japanese fisherman, knowing full well that dolphins operate primarily with their sense of hearing, send noises under water that drive the dolphins into the cove. 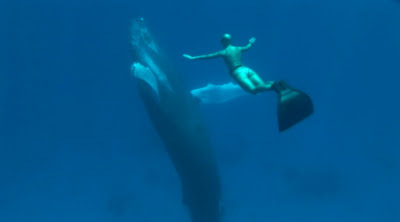 Once there, a net surrounds them so that they cannot just swim back into the ocean. A small selection of these captured dolphins, mostly female and more adorable than the rest if you will, are shipped from there to seaquariums around the globe for anywhere between $150K and $200K per dolphin. The rest are brought around the corner to a second cove. This cove is not accessible to the public and what goes on there in secret would turn your stomach in as many knots as it turns the water red with blood. The mercury-ridden dolphin meat is then sold in shops and passed off as whale meat to the innocent Japanese people, making this not only a crime against the animals themselves but also one against humanity itself. Even if they had alerted the American government, it isn’t likely they would have been any help. The Japanese government is so entrenched in the dolphin trade and billions of dollars would be lost if it were to be shut down. That said, THE COVE, if it continues on its successful path, actually has great potential to bring down this decades old trade. “The Japanese government is starting to feel it. 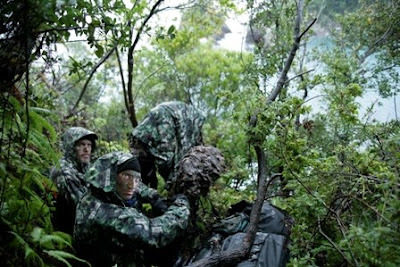 It is sort of like a tsunami is rising up around them,” Psihoyos claims when asked if THE COVE has had any impact yet. “They’re hoping it just goes away but I’m hoping it crushes them.” As the film rolls out into theatres around the world and it motivates all those who see it to reach out to their own governments for change, it seems that all of the painstaking effort that went into the film might actually pay off in the best way imaginable. Psihoyos had to assemble a team of filmmakers and non-filmmakers alike to make THE COVE possible. As the cove in Taiji was heavily watched by a number of mysterious interested parties, and Psihoyos and his crew were constantly followed wherever they went, they had to ditch the eyes on them and go in at night in order to set up cameras and sound equipment to capture what no one had been able to prior. 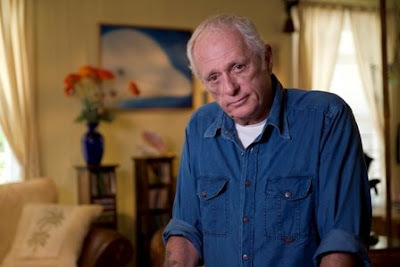 To do this, he enlisted the help of cinematographers who knew how to hide cameras in rocks so that no one would notice them, divers that could place these cameras underwater and the world’s leading dolphin activist, Ric O’Barry (pictured just below), as a guide to the area and its dangers. Second of course to the atrocities regularly carried out in Taiji, O’Barry’s story is an oddly compelling secondary focus. O’Barry was responsible for the capture and subsequent training of the five separate dolphins that played Flipper in the popular 1960’s television program of the same name. Before “Flipper”, dolphins were not nearly as popular with the masses as they are now. It wasn’t until ten years after their capture that O’Barry had realized what he had done. When the most prominent dolphin playing Flipper died in his arms in what Barry described as dolphin suicide (dolphins are conscious breathers, unlike humans, and decide each time they take a breath to do so; this dolphin decided not to take any more), he realized that dolphins were not meant for captivity. He has spent the last 38 years trying to correct his great wrong. “I used to operate from a place of guilt about 20 years ago,” O’Barry confides to me the same day I meet with Psihoyos. “Now, it is just like breathing. Someone calls me to rescue a dolphin and I just do it. And now, with this film, I feel vindicated.” In fact, O’Barry got an e-mail while we spoke about another dolphin in need and he yearns to get back to work after the film’s promotional tour. He is happy to help get the word out but he cannot wait to get back to Japan, even if it means being arrested for lying about his involvement with the film. “Arresting me in Japan would be like arresting Flipper. It would draw a lot of attention.” It almost sounds like he wants it. What happens when a hypocrite and a liar actually has something to say this time? That being said, what is happening in Taiji is disgusting and deserves condemnation. The slaughter is an outdated and outlandish practice that serves no one. I was not sure I would publish this comment when I first read it. The only reason I did was because you singled out the issue as important regardless of those involved promoting it. As long as the message is still intact, I am good with it. That said, when I interviewed Barry, he made a comment that struck me as odd. I asked if he would rather be out saving dolphins than working the press circuit and he said that of course he would, that he wasn’t getting paid for the interviews after all. It was jarring but I followed up with more dolphin questions. Thank you for your perspective. It is appreciated.